Going on your first cruise is exciting, fun, scary, challenging, frustrating, aggravating… And sometimes, all of that within moments of each other. We boarded the ship (and what a ship it is - almost 300 meters or 320 yards long, 86 thousand tons with 900 crew members, 12 decks and a top speed of 22 knots or more than 25 mph and built in Helsinki, Finland in 2000) on Wednesday. According to several MacMania veterans, the boarding process on this particular ship took much longer (4 hours) and was much more disorganized than previous cruises on the Holland America line. 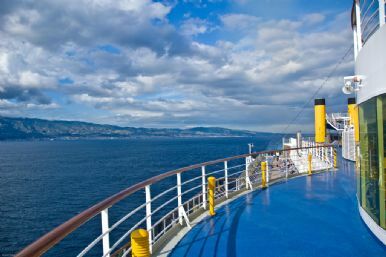 A more serene cruise view. But once on board and in our lovely cabin at the rear of the ship (we’ve had great views all cruise! ), we discovered the wonders of life on board - ridiculously happy and friendly crew, a clean and attractive ship with plenty of facilities (several places to eat, at least half a dozen bars, 2 pools and hot tubs, a gym and, yes - even a shuffleboard court) and a whole bunch of fellow Mac users! We started off the cruise leaving the port of Savona with the orientation/cocktail party sponsored by Microsoft - their Senior Evangelist for the Macintosh Business Unit, Kurt Schmucker and his lovely wife were on board - where we learned more about the cruise line itself and the MacMania8 classes and seminars. While net access was limited to “Web Only” for the first 24 hours or so due to issues with the ship’s server setup. Makes getting done the things you’d like to/need to get done very difficult! But once it was fixed, we could get (almost) full net access and, while slow, was fine for the duration of the cruise. We’ve had very good weather in each city so far (5 ports of call to this point with 3 more to go) even though there have been some spectacular thunderstorms in the evenings while we are at sea. 60 minutes before our fascinating tour of the ruins of Pompeii we had torrential rains that threatened to force us to cancel the excursion but the weather cleared and I think I got some really nice photos of it and Italy in general. If you’ve ever had any concerns about “the motion of the ocean” fear not - it’s barely noticeable even during a beautiful thunder storm we went through one night. We spent all day Saturday at sea before we put into Alexandria, Egypt where our excursion was the best of the trip - the Great Pyramids at Giza. 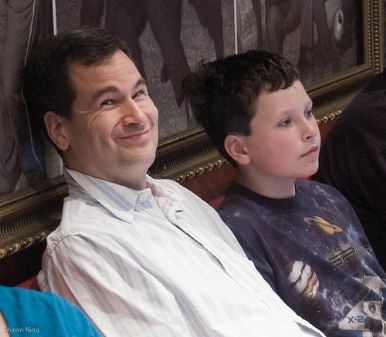 David Pogue (left) enjoys a session at MacMania. MacMania classes happen during the “at sea” hours so you don’t need to miss any of the info. Seven instructors do classes on everything from “Extreme Googling” and “iPhone: The Missing Manual” by David Pogue, Mac Productivity Bootcamp by Don McAllister, automation tips from Apple’s Applescript Guru Sal Soghoian and all kinds of Photoshop tips and tricks from my favorite instructor, Lesa Snider King! As always, I enjoyed David Pogue’s classes. Even if you know what he’s going to say ahead of time, he’s so entertaining you don’t mind listening to it again. Bebo White had some thought provoking ideas on “What’s Left in User Interfaces?” and Randall Schwartz had some great MacGadgets to talk about. The other aspect of MacMania that is a hidden gem is the informal conversations held everywhere - in the “Ingenious Bar” (a bar on board ship where MacManiacs congregate), on the bus into Alexandria, at dinner each evening or at one of the special parties held just for participants. It’s like a small Macworld Conference - except this conference is held on a massive cruise ship that sails through the cradle of civilization. From Pompeii, Italy to the Great Pyramids at Giza to beautiful Santorini, Greece, we have traveled to places most people only dream of and seen sights that my imagination couldn’t do justice to. And we’ve still got five days, four ports and three more countries to go! Shawn King is the Host/Executive Producer of Your Mac Life.